Dog sledding is so much fun! During winter we offer dogsled trips in Hálsaskógur, close to our home, Kjarnaskógur near Akureyri or various locations. 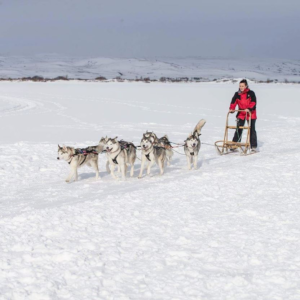 What a great way to travel, sitting on a sled and being pulled by beautiful, strong huskies. The experience will last 1 to 1½ hour. Price: 30.000 ISK per person. 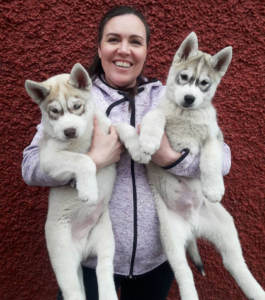 Have you ever been pulled by a husky? Here is your chance to try. 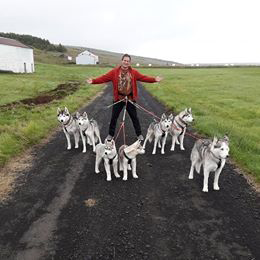 Come and walk with the dogs in beautiful areas close to Akureyri. Choose a nice and easy walk through Hálsaskógur or Krossanesborgir with a view over Eyjafjörð bay or an adventure walk on the rabbit trails in Kjarnaskógur. The experience is around one hour. Price 10.000 ISK per person / 6.000 ISK per person for two people or more. You are welcome to visit our dogs at their home, grab a cup of coffee and take lots of pictures. Our dogs are very lovable and like meeting new people. Coffee, camera and huskies, what a great combination! The visit can last up to one hour. Price: 5.000 IKR per person / 3.000 ISK per person for two people or more.